“An astounding 13 percent of Illinois’ population—1,647,527 people—doesn’t have health insurance now and can get it in 2014. It is crucial that we know who is uninsured and where they live." Today, in conjunction with the March 23 second anniversary of the Affordable Care Act, Health & Disability Advocates launched Visualizing Health Care Reform, a unique, interactive map atvisualizingreform.illinoishealthmatters.org that allows users to see, at the state, regional, and community levels, the numbers of Illinois residents who are uninsured now and will be able to obtain health insurance coverage when the Affordable Care Act is fully implemented in 2014. 610,821 will be eligible for Medicaid. 776,040 will be eligible to purchase health insurance with a subsidy. “An astounding 13% of Illinois’ population—1,647,527 people—doesn’t have health insurance now and can get it in 2014. For the state to plan a smooth roll-out ofthe Affordable Care Act, it is crucial that we know who is uninsured and where they live,” says Barbara Otto, CEO of Health & Disability Advocates. She adds that those who stand to be helped the most are the more than 600,000 people who live at or below 138% of the federal poverty level (FPL) ($32,000 for a family of four) but who do not currently qualify for Medicaid and can scarcely afford to obtain health care. The interactive map allows users to pinpoint 87 community areas in the state. 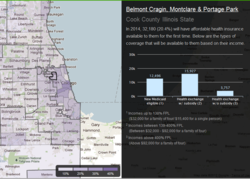 While the largest percentage of residents to be eligible for health care coverage under the Affordable Care Act are in urban Cook County, outside of Cook County several areas have surprisingly high levels of uninsured individuals. About 21.8% of the residents of Aurora Township in Kane County, 18.7% of the residents of the Benton, Waukegan, and Zion Townships in Lake County, and 17.6% of the residents of Joliet and Troy Townships in Will County lack insurance. Visualizing Health Care Reform provides an easy-to-grasp, graphic estimate of the number of middle-income uninsured Illinois residents—1,036,706—who will be eligible to purchase insurance, either with or without a federal subsidy, throughhealth insurance exchanges that will be established over the next two years. Visualizing Health Care Reform reveals areas of the state where the need is highest. Not surprisingly the largest numbers of uninsured are in Cook County. However, Kane, McHenry, Kendall, and DuPage Counties incorporate townships where there are extremely high levels of people living at or below 138% of the FPL who do not currently receive Medicaid but will become eligible for it in 2014. In Algonquin and Grafton Townships in McHenry County, 42.8% of the residents living at or below 138% of the poverty level will become newly eligible for Medicaid. In Milton and Downers Grove Townships in DuPage County, about 35% of those below 138% of the poverty level will become eligible for Medicaid. Will, and Macon Counties also include communities with large numbers of people who will become eligible for Medicaid under the new health care law. In the Chicago neighborhoods of South Lawndale and the Lower West Side, some 35,778 people (35.3% of the population) will have affordable health insurance available to them for the first time in 2014—a change that will have a large impact on community health care providers. Some 16,034 of these residents will have access to Medicaid. Another 16,933 people between 139 and 400% of the FPL will be able to buy private insurance using a subsidy, no matter what their pre-existing conditions. A total of 2,811 whose income is over 400% of the poverty level ($92,000 for a family of four) will be able to buy health insurance from a state-based health insurance exchange, though no subsidy will be available to them. This insurance is expected to cost less than private insurance does today. While the Affordable Care Act is good news for many people who will become insured, HDA cautions that Medicaid cuts at the state level could still spell hardship for many families, as the state seeks to lower reimbursements and cut certain services from coverage. “It’s going to take time and investment to change from a system of ‘sick care’ to a system of health care,” notes Otto. Visualizing Health Care Reform is funded in part by The Chicago Community Trust and the Lloyd A. Fry Foundation. The website was designed by William Wang. Data analysis was conducted by Rob Paral & Associates based on estimates derived from the American Community Survey of the U.S. Census Bureau.